I blame it all on a reader. When I made my own cayenne powder, I had trouble making a powder with the electric coffee grinder I was using. A reader sent me an email, saying that she uses a mortar and pestle to grind up her cayenne peppers. From that moment, I wanted my own mortar and pestle. They are very versatile and non-electric. They can grind just about anything. You can make delicious guacamole in them. That alone was a great reason. 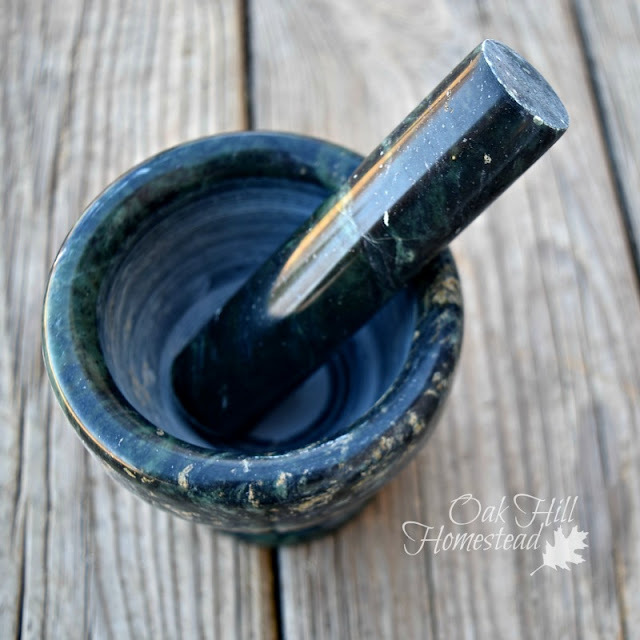 For Christmas I added "mortar and pestle" to the wishlist our children requested. Evidently they didn't discuss it among themselves because I ended up with two. But after researching them a bit, I read that it's a good idea to have two - or even more, depending on how you plan to use them. If you make guacamole and salsa, you might want a separate mortar and pestle so that the stronger herbs and seeds you grind won't flavor these more delicate dishes in an odd way. The next thing I learned is that a new mortar and pestle must be seasoned, like a new cast iron pan needs to be seasoned. The actual process is different but they both need to be prepared before they are used for the first time. A new mortar and pestle set needs to be seasoned to remove stone grit from the inside. The interior surface is left rough and unpolished so the items you're grinding can "grab" the bottom and sides and not jump out of the bowl. Without seasoning it first, you'll end up with sand or grit in your food. First wash the mortar with hot water and let it air dry. Never use soap or it will flavor your food. 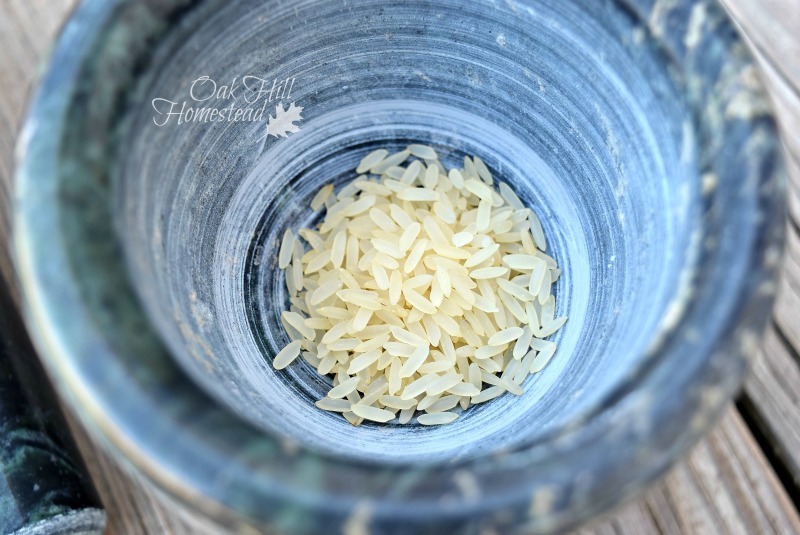 I found some websites that recommend taking your mortar and pestle to the car wash and using the pressure washer to begin the process, but they all agree that the main step is to grind a small handful of uncooked white rice. You'll need to do this several times, until the rice powder is "clean" and has no grit or color in it. A couple of websites suggested adding a little water so the rice won't jump out of the mortar, so that's what I did. After pouring out the rice powder, some recommend a second step (or third, if you went to the car wash first): grinding several cloves of garlic, then adding a teaspoon of salt and another of sugar, and finally some peppercorns. Mash this into a smooth paste and rub it around the inside of the mortar. Let it set for about thirty minutes, then wash it with hot water and let it air dry. 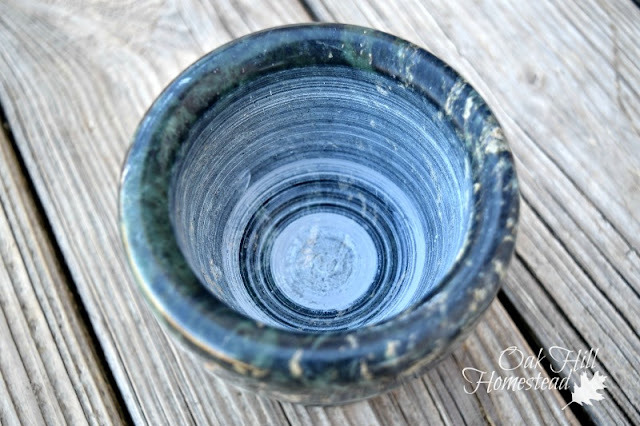 Your mortar and pestle are now ready to use. 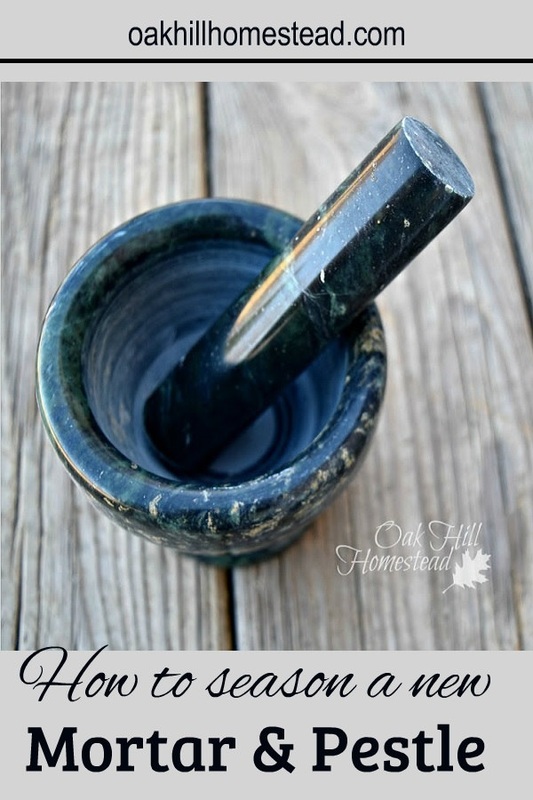 Do you have a mortar and pestle? How do you use it? Share in the comments. I participate in the Amazom.com affiliates program. If you make a purchase after following one of my affiliate links (like the ones above) I earn a small commission, but it does not affect the price you pay. For more information please see my disclosure page. Hi Gwen. 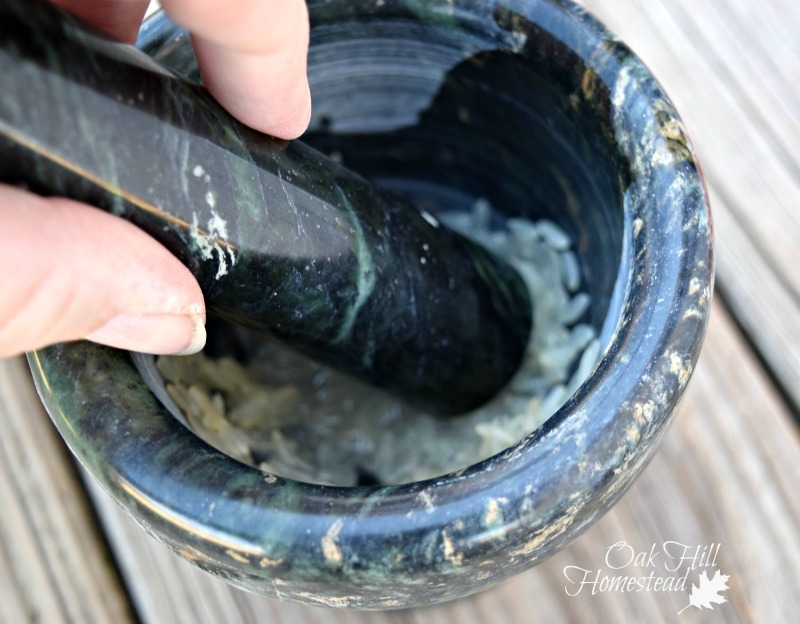 I imagine that since you've had your mortar and pestle for several years you've probably already gotten the grit out of it. :-) They are sure handy for grinding cloves and such; I have a jar of whole cloves that I bought by mistake and have needed ground cloves a few times, and it would have been nice to be able to grind them up. Yes, you can make salsa, there are several YouTube videos on how to make it in a mortar and pestle, or the Spanish word "molcajete" (I hope I spelled that right). I have that same mortar and pestle and have had it for 11 years (we got it as a wedding gift). In the past two years or so I've used it more often as we've gotten more into natural living and homemade foods. I didn't know about the seasoning thing, I'll have to try it. Wonder if it will still work since I've been using it without seasoning... Worth a try I suppose!! Thanks for sharing, visiting from the homestead blog hop :). 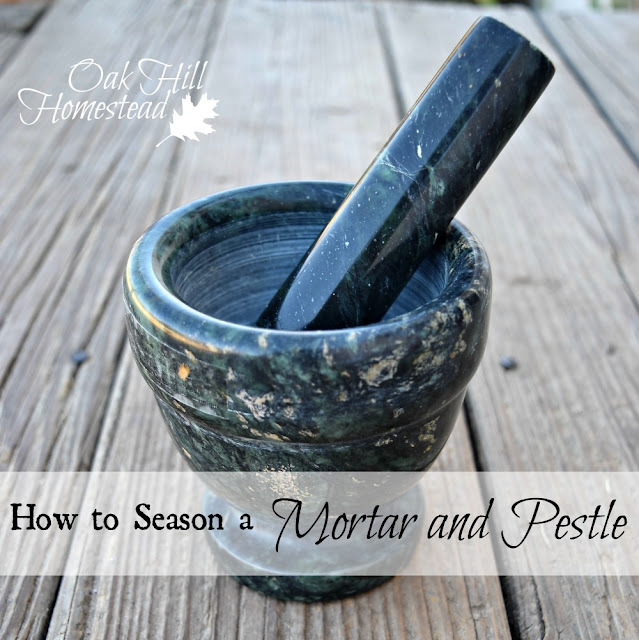 I wasn't aware mortar & pestle required seasoning. Thanks for the helpful information. And thanks for sharing on Simply Natural Saturdays! Very useful post, thanks for sharing with Hearth and soul blog hop, pinning and tweeting. Thank you for sharing, Jennifer.